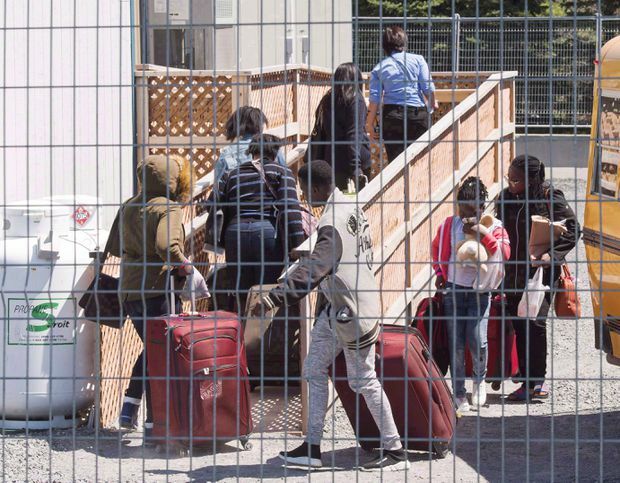 A group of asylum seekers arrive at the temporary housing facilities at the border crossing in St. Bernard-de-Lacolle, Que., on May 9, 2018. As the number of irregular asylum seekers arriving in Canada appears to be slowing, work is quietly under way to speed up refugee processing and address a major backlog of asylum claims that has been growing steadily since early 2017. Newly published federal data shows 1,019 irregular migrants were apprehended by the RCMP crossing into Canada between official border crossings last month. That was the third consecutive month of decreases in irregular migrant arrivals and the lowest monthly number since June 2017. But while the number arriving “irregularly” via nonofficial entry points may be on a downward trend, the Immigration and Refugee Board (IRB) – the arms-length agency that adjudicates refugee claims – has struggled to keep pace with the number of new cases being added to its backlog of files. Of the 34,854 irregular migrant claims that have been referred to the IRB, less than one quarter of them have been finalized. A total of just over 64,000 refugee claims – including irregular arrivals and those from various other streams – are awaiting a decision at the IRB. Refugees are now waiting close to two years to have their cases heard. But a number of new measures have been rolled out in recent weeks and months aimed at tackling the backlog of claims. Last week, the IRB quietly announced a task force for less complex cases, which will focus on claims that can be quickly resolved. A pilot project in Montreal and a new asylum management board have also been established to improve information sharing and co-ordination between departments to speed up processing. But while the Liberals did set aside $74-million to help shrink the backlog, the IRB says its ever-growing inventory of claims still “substantially exceeds” the board’s funded capacity. That’s why it is now strategically trying to tackle simpler claims that can be finalized more quickly. Several requests to speak with IRB chair Richard Wex since his appointment in the summer have been turned down. The Trudeau government also recently reopened the IRB’s Ottawa office, which the previous Conservative government closed in 2014. That, coupled with adding more staff, has made a difference in speeding up some refugee claims, says Ontario-based immigration lawyer Gordon Scott Campbell. “None of us really understood the (2014) cuts, because it wasn’t going to reduce any volume, it was just supposed to save some money … But ultimately the more adjudicators the better, because ultimately that’s the only way you’re going to move more cases through the system,” Campbell said. Immigration Minister Ahmed Hussen’s press secretary Mathieu Genest says the board will be able to hire 248 new staff over the next two years, including 64 new decision-makers, thanks to this year’s cash infusion from the Trudeau government. But the government has yet to provide an official response to a sweeping independent review of the IRB released in June that identified persistent and systemic problems and a long history of failure to manage spikes in asylum claims and backlogs. The review made a number of recommendations, including some that would mean fundamental changes to the way the board operates, such as bringing it under the authority of the immigration minister. This particular recommendation was met with wide opposition from key stakeholders and refugee advocates, who would prefer to see the board remain independent. NDP immigration critic Jenny Kwan says she would be concerned about political interference if the IRB – a quasi-judicial body – were indeed brought under the auspices of the department. She also believes the government’s new investments in the board don’t go far enough. “I think the government has actually mishandled this situation for some time now, as even prior to the influx of asylum seekers from the United States, we’ve had a backlog,” Kwan said. Kwan has been calling on the government to provide a fulsome response to the IRB review recommendations and for the Liberals to provide more funding to the IRB to reduce the backlogs. “The (recent) injection of funds is insufficient,” Kwan said, noting new decision-makers at IRB are only being hired for short-term contracts.